Durban is a city of two halves. The slums and street hawkers contrast sharply with the upmarket houses and shopping malls of the city's wealthy suburbs. It is in this setting that political and business leaders will gather at the World Economic Forum for Africa to debate how the benefits of economic growth can be shared by all across the continent. The importance of tackling inequality in Africa cannot be overstated. Inequality is undermining growth and threatens to reverse the gains that have been made in the fight against poverty. Four of the world’s five most unequal countries are in Africa. In South Africa, three billionaires own the same wealth as the poorest half of the population - around 28 million people. Decades of unprecedented economic growth have bypassed millions of Africans, and all too often it is women and young people at the bottom of the pile. If those attending the World Economic Forum on Africa in the coming days are truly serious about achieving inclusive growth, they need to start thinking outside the money box. Inequality can’t be solved by tweaking our current economic model. A fundamental change in how we manage our economies and who we manage them for is needed. Rather than engineering our economies solely to maximise GDP, Africa’s business and political leaders must build economies explicitly designed to end poverty and inequality. Instead of presiding over an economic system that panders to big business and a wealthy elite, a more human economy must be established, which meets the needs of African women and young people. Oxfam’s new report, "Starting with people," sets out how African leaders can do this. It starts with governments that are accountable to their people. Governments that prioritise public services, and those economic sectors, new technologies and tax systems that bring the maximum benefit to society as a whole - and particularly to the poorest among us. If the priorities are ending poverty and inequality, governments would invest in economic activities that have the biggest impact on poverty alleviation. In most countries across Africa this would mean small-scale agriculture. Agriculture is the main source of income for 90% of Africa’s rural population, yet only 10 out of 44 African countries have delivered on their promise to spend 10% of their national budgets on agriculture. If the priorities are ending poverty and inequality, governments would foster business models that share the benefits of economic success more fairly - rather than corporations that churn out profits for wealthy shareholders regardless of the impact on workers, the environment and society. Alternative business structures, such as co-operative or social enterprises, are not new. More than one billion people globally are members of co-operatives that generate more than 250 million jobs. If the priorities are ending poverty and inequality, governments would create tax systems that ensure big business and the richest in society pay their fair share of tax. African countries lose billions every year because of tax dodging by big corporations and wealthy individuals. They lose billions more from overly generous tax incentives in a misguided belief that this is the only way to attract foreign investment. This is not about a backwards looking economy. It is about one that embraces the future, for all Africans. When I talk about small-scale farming, it is not peasantry that I see, but thriving rural communities producing food, adding value through local agri-processing and meeting the needs of growing urban markets. When I talk about new business structures I include businesses that embrace the opportunities of the Fourth Industrial Revolution in a way that shares the benefits of new technology, rather than concentrating them in the hands of those that own the tech. And when I talk about a strong role for government I do not mean big man politics. I mean open, inclusive democracies with freedoms for civil society. This is all about sensible economic policy-making focused on the things that matter. As Africa’s government and business leaders meet in Durban this week, they must rip up the old economic conventions that are failing people across our continent and build a new African economic system that will deliver for all. 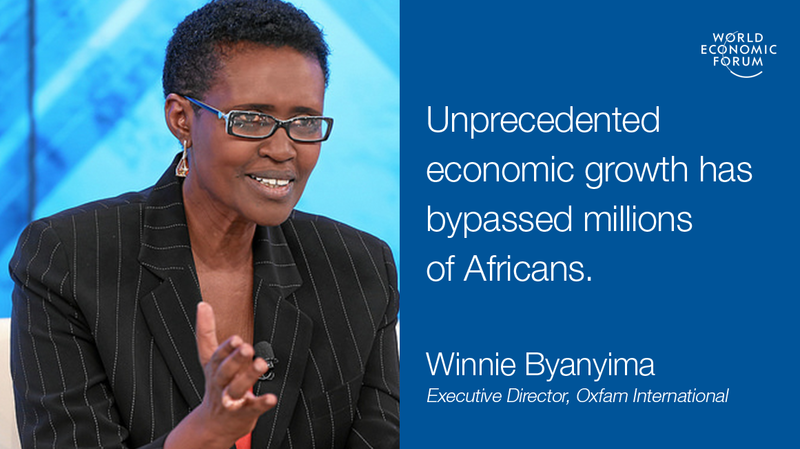 Winnie Byanyima is a co-chair of the World Economic Forum on Africa 2017.